Wow! 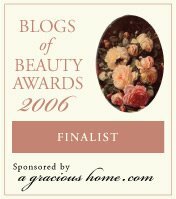 I hadn't even realized it was time for the Blogs of Beauty Awards again...and there was Like Merchant Ships on the list of finalists! Thanks so much to the readers who were kind enough to nominate this blog for Best Frugality. My fellow finalists, Biblical Womanhood and The Common Room, have both taught me a thing or two about saving money this year. It's easy to be cheerful about frugality when you're in such good company! You're certain to find some new friends by exploring the Blogs of Beauty ballot at A Gracious Home. If you have time to vote this week, just email Sallie with your favorite blog for each category.